The Jarrett Meeker Foundation is a 501(c)(3) tax-exempt organization. An ALL volunteer organization. Tax ID# 33-0372440. In July 1987, in memory of Jarrett Meeker after his accidental death on April 27, 1987. Jarrett was an eight-year old third grader at Murdock Elementary School in the La Mesa-Spring Valley School District in San Diego County, CA. 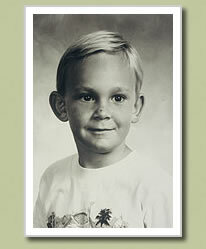 He was an active, fun-loving little boy who loved nature and all living things and was nicknamed the Little Zookeeper. This affection to nature was not limited to animals; he had a genuine concern for people and in particular, for other children who had less than he had. What is the meaning of the JMF logo? Our logo originated from a vision that Judy Meeker had the day of her son’s accident. She was in the sheriff’s car, following the ambulance, when she saw Jarrett, surrounded by animals, doing what he enjoyed—fishing. He told her that he was okay, and not to worry. Keith and Judy Meeker are grateful they were able to provide Jarrett with outdoor adventures. When they lost him, they were inspired by his love of nature and people to give kids that aren’t as lucky the same chance to experience and learn about nature as Jarrett had. The foundation and the work it does is Jarrett’s gift – his legacy. What is the JMF Mission Statement? The Mission of the Jarrett Meeker Foundation is to provide programs related to wildlife, conservation and the environment for children and young adults in San Diego County. The programs we support have a meaningful and lasting impact on the lives of those children we serve and help to improve he condition of our natural world. What is the JMF Vision? To expand our support of educational programs to benefit children and young adults throughout San Diego County relating to wildlife, conservation and the environment. To broaden our list of beneficiaries. To work with partners who share and support our aspirations. How does JMF intend to accomplish the above goals? Our enthusiastic and dedicated board members will be completely knowledgeable about JMF and its goals. As ambassadors of JMF, they will be able to tell others they meet about JMF and the work that it does and encourage people to donate and support our efforts. Our board will be comfortable with asking others to help support the work of JMF. JMF will seek out those in San Diego who share our mission to educate children about the environment and who want to partner with us. JMF will have a strong public relations campaign to let the public know who we are and what we are doing through a newsletter, press releases, video presentations and our ambassador board members. What specific programs does JMF support? Campout Destination Nature is a program designed to meet the needs of our students through hands-on interactive learning strategies . This authentic overnight ten camp experience provides the students with the ability to explore firsthand the outdoor environment in a thrilling and adventurous learning experience. Student reconnect to our natural world fostering the desire to be good steward of the environment. How does JMF raise funds? JMF accepts monetary donations year-round from individuals, families and corporations who want to support our activities.